McCrillis Hill Copper Works is located in the lakes region of New Hampshire, near lake Winnipesaukee, and among the White Mountains. 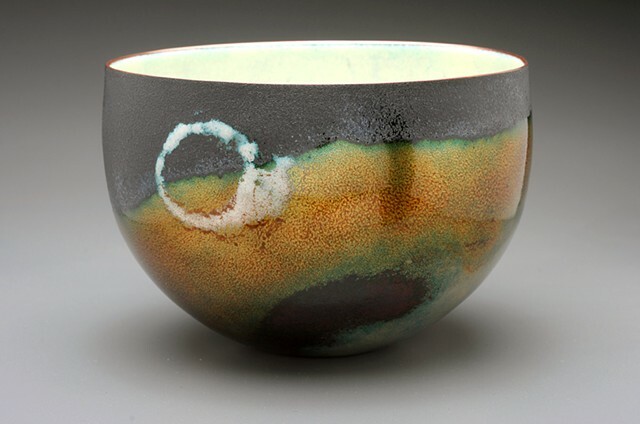 Brenda and Allen Caswell create each piece whether it is a coaster or a vessel here at our studio. We design the shapes, spin or raise them, and then apply the enamels or patina that create these designs. The metal, and the enamel need to complement each other, they work together. All the work we do is hand crafted and as such there are no two pieces exactly alike. We are constantly interacting with what we did yesterday and what we see today. That is what makes the process of creating these works so exciting. Brenda received her BA, from Plymouth State College and went on to open a weaving studio that made hand woven clothing as well as wall hangings that are in the collection of the State of New Hampshire, Loon Mountain Hotel, and private collectors. Allen is a self taught metal-smith.